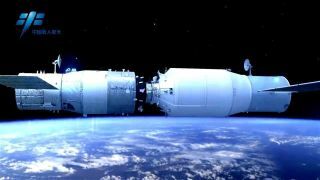 Artist's illustration of China's robotic Tianzhou-1 cargo spacecraft docking with the Tiangong-2 space lab on April 22, 2017. China's first resupply craft, Tianzhou-1, has been deorbited under orders from ground controllers. Following a set of braking maneuvers, the robotic cargo ship plunged into Earth's atmosphere and burned up late Friday (Sept. 22) Beijing time, according to China's state-run Xinhua news agency. Tianzhou-1 launched on April 20 and docked with China's orbiting Tiangong-2 space lab two days later. Over the past five months, Tianzhou-1 and Tiangong-2 accomplished a trio of refueling sequences: One on April 27, a second on June 15 and a final one on Sept. 16, Xinhua reported. Tiangong-2 was unoccupied during these activities. Chinese space officials view the refueling and docking activities as a prelude to the country's building of a larger space station in the mid- 2020s.